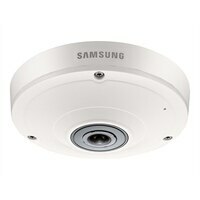 Samsung Techwin SNF-8010 Network surveillance camera domeThis Samsung fisheye camera features 5MP and captures smooth video at a high framerate with true day and night function. Built-in on-camera dewarping allows instant access to the single PTZ, quad view and panorama views. Bi-directional audio allows great situational awareness. The micro-SDXC memory card slot creates a cost-effective edge recording solution. Alarm triggers include intelligent motion detection, audio detection, tampering detection, alarm input and network disconnection. The camera can work effectively in demanding environments that are prone to severe or varying weather conditions as well as tampering or physical attack.